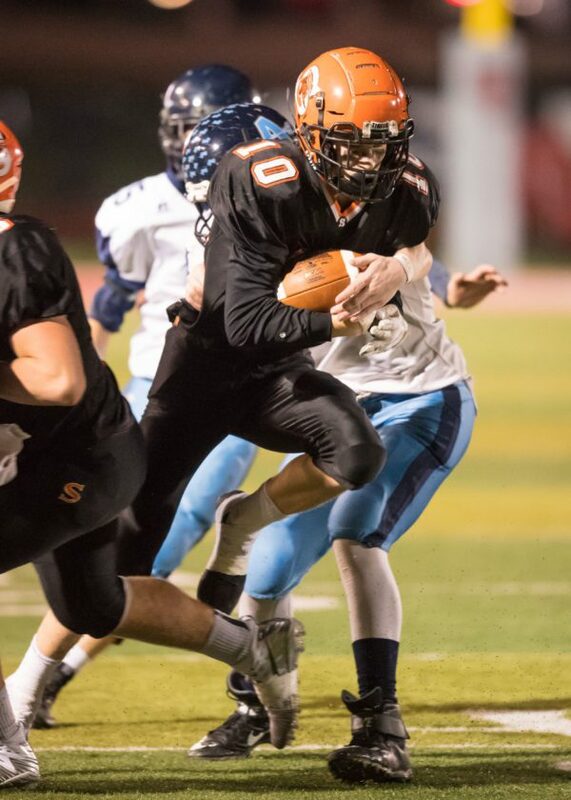 SHADYSIDE WIDE receiver Kelly Hendershot has been one of the premier playmakers in the area this season. He and the Tigers will make the trip to Zanesville’s Sulsberger Memorial Stadium Friday night to take on Bainbridge Paint Valley, which is the top seed, in the Region 23 semifinals. ZANESVILLE — Shadyside hasn’t been to the Ohio High School Athletic Association high school football regional finals since the 2014 season. To get there, it had to defeat Paint Valley (41-15) in the second round at Maysville. In order for the Tigers reach that destination this year, they must go through the Bearcats once more. Fourth-ranked Shadyside (9-2) and No. 1 Paint Valley (11-0) will renew acquaintances here Friday night in a Division VI, Region 23 semifinal on the artificial surface at Sulsberger Memorial Stadium. Kickoff is set 7. The winner gets the survivor of No. 2 Fort Frye (10-0) and third-seeded Galion Northmor (10-1) a week from Friday with a berth in the state semifinals on the line. The two battle-tested squads advanced last weekend with victories on different ends of the spectrum. The Tigers roared past Adena, 34-6, at Red Devil Stadium in St. Clairsville, while the Bearcats were outlasting Columbus Grandview Heights, 39-36, at Chillicothe’s Obadiah Harris Family Athletic Complex. “They are a lot like last week’s opponent,” Shadyside head coach Mark Holenka said of Paint Valley. “They are really balanced on offense. They have some nice running backs, but they are capable of throwing the ball, as well. They must be doing something good because they are 11-0. In Shadyside’s lop-sided victory last week, the defense rose to the occasion. Although it allowed 213 yards of total offense, only 35 of that came through the air. The Tigers stop troops are giving up a mere 11 points an outing. They have recorded just one shutout but have held four other opponents to single digits. Shadyside employs a 4-3 defense with juniors Sam Merryman (6-2, 183) and Jakob Klug (5-11, 175). The tackles are freshman Gage Joseph (5-10, 226) and junior Matt Lucey (6-0, 198). Merryman and Joseph both have logged 4.5 quarterback sacks each. Merryman has eight tackles for minus yards, while Joseph has half-a-dozen. Klug and Lucey have evenly split eight TFLs. The linebackers are the Tigers strength on defense. Senior Connor Banco (6-2, 197) is healthy and is playing at a solid pace. In nine games he has charted 42 solo and 39 assisted tackles, while also making seven negative stops. He is flanked by rugged sophomore Jacob Visnic (5-10, 204) and promising freshman Wyatt Reiman (5-9, 161). Visnic has made 40 solo tackles and assisted on 41 others — both team highs. His eight negative stops are tied with Merryman for the team lead. He has also intercepted two passes. Reiman, who missed two games due to injury, has logged 36 solo and 26 assists. When Reiman missed time, freshman Mason VanNest (5-10, 140) filled in admirably. The secondary consists of sophomore Jordan Joseph (5-9, 145) and freshman Rhys Francis (5-10, 150) at the corners. Athletic junior Kelly Hendershot (6-2, 165) is the free safety, while senior Colin Holmes (5-8, 155) is the strong safety. Senior Austin Price (6-3, 180) also sees action. Hendershot has three interceptions. Offensively, the Tigers line has made the biggest improvement from the beginning of the season. The group of trenchmen consists of senior center Andrew Jobe (6-1, 212). The three-year regular is flanked by senior right guard Zeke Merryman (5-11, 210) and junior left guard Ryan Cain (5-5, 207). The right tackle is junior Caleb Davis (5-10, 248) and senior Ian Falcione (5-11, 193). The improvement of the line has allowed Shadyside to become a more balanced team as far as the run-to-pass ratio goes. Quarterback Anthony Coggins (6-0, 155) has turned in a solid senior season. He has passed for 2,187 yards by completing 62 percent (137-221) of his passes. He has thrown 22 touchdowns and five interceptions. While Hendershot (46 catches, 74 yds., 8 TDs) has been Coggins main target all season, Merryman has come on strong down the stretch from the tight end slot. Of his 31 receptions, five came last week for 105 yards and a touchdown. He has accounted for 466 stripes and five six-pointers. Price and Holmes have been slowed by injuries, but are ready to go. Price has caught 11 passes for 189 yards and two scores, while Holmes has latched onto nine for 148 and a TD. Banco and Visnic give the Tigers a pair of punishing runners in the backfield, while Reiman and Hendershot add speed to the offense. Banco has gained 641 yards after eclipsing the 1,000-yard barrier a year ago. However, the aforementioned injury has a lot to do with the decline. He has scored 13 touchdowns and averages just over 70 yards a contest. Visnic has run for 329 yards and six scores, while Reiman has 275 and six TDs. Hendershot adds 224 and three scores and Coggins has chipped in 143 and two TDs. The Tigers special teams are solid with Hendershot averaging 34 yards on 21 punts. He has pinned the opposition inside its own 20 three times. Sophomore Angel Velasquez has turned in a superb season as the placekicker with 40 of 47 accuracy. “We played them in 2014 and it doesn’t look like much has changed. They are your typical fast, aggressive kids that fly all over the field,” Paint Valley head coach Pete Hollon said of the Tigers. In Paint Valley’s shootout victory last week, junior running back Brayden Ison (5-11, 185) ran for 187 yards and scored on runs of 50, 41, and 20. Junior fullback Lane Mettler (5-11, 165) added 81 yards and two scores, while junior Iann Cockerell (5-11, 165) had 79 yards. Mettler is considered a tough blocker. Cockerell leads the trio with 873 yards and nine touchdowns on the season. Ison checks in at 643 and nine scores, while Mettler has reached the end zone 12 times and has 561 stripes. Junior quarterback Bryce Newland (6-4, 210) passed for 79 yards and a touchdown on 7-of-14. He was also intercepted once. For the year, he has passed for 11 touchdowns and just one pick. Junior Cruz McFadden (6-1, 170) is the top receiver with 12 catches for 263 yards and a trio of TDs. Mettler has 101 tackles, 16 TFLs and 11 sacks from his linebacker spot. Cockerell has 91 tackles from the strong safety, while junior Andrew Walker has 96 tackles. Senior nose tackle Quintin Daniel (5-10, 180) has 91, nine stops for lost yardage and five sacks. Cruz had three interceptions. Paint Valley has been effective on special teams as Cockerell averages 40.8 yards a punt. He has dropped eight inside the opponents’ 20, and is 7-for-8 on fakes He has allowed zero return yards. The Bearcats have also blocked five punts. McFadden has returned both a kickoff and a punt for touchdowns. The Bearcats play in the Scioto Valley Conference with Chillicothe Unioto, Chillicothe Zane Trace, Adena, Huntington Ross, Piketon, Williamsport Westfall and Richmond Dale/Southeastern. They won the conference’s Gold Ball for going undefeated. The previous two seasons, they combined for seven victories. Paint Valley is in the playoffs for the 11th time. It is 8-10 overall. Shadyside, meanwhile, is making its 14th postseason appearance. It is 30-19 all-time.